Brand consistency across digital and print marketing collateral is essential, and standards and tools that are easy to share across your team and across properties make that easier to manage. What does #AptChat Nation use to keep their marketing consistent? How detailed do they get? How do they handle consistency when there are multiple entities involved? Q1: Between all the digital tools, print materials and everything else, what do you do to keep your branding consistent today? Q1a: How detailed do you get? Are you creating a master “style guide?” Do you train staff on things like fonts, colors, etc.? Q2: What are some of your favorite tools for keeping collateral consistent? What helps you manage this across your team? Q3: What are all the diff types of use cases you need to consider? Signs? Flyers? Uniforms/apparel? Social media covers/icons? Q4: How do you balance brand consistency when there’s a property brand, a management brand, and sometimes an owner brand? Q5: What else do we need to consider when trying to keep our marketing consistent? Anything else you’d recommend? Q5a: Are there questions *you* have about marketing/brand consistency? Now’s your chance to get them answered! Between all the digital tools, print materials and everything else, what do you do to keep your branding consistent today? How detailed do you get? Are you creating a master “style guide?” Do you train staff on things like fonts, colors, etc.? What are some of your favorite tools for keeping collateral consistent? What helps you manage this across your team? What are all the diff types of use cases you need to consider? Signs? Flyers? Uniforms/apparel? Social media covers/icons? @AptChat I draw a Story Board, using exact fonts, color schemes, etc. & photos … Got to tell a story. #AptChat You have onsite TALENT. Use It! How do you balance brand consistency when there’s a property brand, a management brand, and sometimes an owner brand? @StephanieOehler @AptChat Use the property mgmt brand to build awareness across the metro market. From there, drive traffic to properties that need the attention. 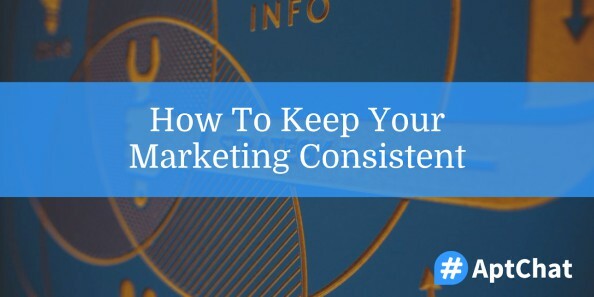 What else do we need to consider when trying to keep our marketing consistent? Anything else you’d recommend? Are there questions *you* have about marketing/brand consistency? Now’s your chance to get them answered! Our next #AptChat is slated for Tuesday, May 9, 2017 at 12 pm Eastern, and we’ll be talking about the hottest trends in digital marketing. In the meantime, be sure to sign up for #AptChat updates to get these recaps and more delivered straight to your inbox!